Mirjam Lüpold is an authority on Tibetan Buddhism and animal-human relations and studied ethnology/social and cultural anthropology and history of religion at the University of Bern. She is the author of the work published at the University of Bern, Tibetan Monks in Switzerland – Analysis of the Importance of Religion for Tibetans in Swiss Exile (1997, in German) and has written articles for publications throughout Germany and Switzerland. Mirjam lives in Bern, Switzerland and works as a translator and journalist and has been involved with Tibetan Buddhist culture for over 20 years. She was formerly married to the brother of the late Lama Chodak Gyatso Nubpa, founder of the Ari Bhod Foundation and Buddhist Center in Los Angeles (http://aribhod.org/). This article is a critical review of animal release, an important practice in Tibetan Buddhism. In recent times, the practice of animal release has become an important facet of western Buddhism, but the ethical ramifications of such practices have rarely been highlighted. This article describes animal release ceremonies, especially in Los Angeles and Switzerland, and provides an overview of the practice. It answers the question of whether these releases are in accordance with the intentions of Buddhist precepts. Non-violence and compassion are core virtues of Buddhism. In the sense of living one’s faith actively, ritual liberations of animals are very popular among Tibetans. But how about the benefits of this practice for the animals who have been set free? The Tibetan monk, clad in a dark red robe, looks like a visitor from another age in the Marina del Rey harbor, in the center of Los Angeles. Sitting in front of a concrete fish tank he murmurs prayers. “May I be able to liberate these animals, tortured in the misery of agony, with the Rain of the Dharma. May they thereby attain enlightenment,” understand those who speak Tibetan. The lama is not disturbed by spectators taking pictures. Close to him, his western disciples and several monks are assembled. With nets attached to long wooden poles they pull fish from the tank and release them into the ocean. A monk on an old, white wooden chair recites prayers from a book. Thoughtfully, he lets the 108 brown prayer beads slip through his fingers. Behind him, at the edge of the dock, seemingly unimpressed by the human crowd, sits a Pelican watching the released fish with interest. A fisherman, at first glance almost taken for a monk because of his red apron, watches the removal of the fish. The money for the purchase of the fish comes from western disciples, Tibetan Buddhists and others who wish to take part in the ceremony. After two hours, it is over. The origin of the ritual, which is very popular among Tibetan Buddhists, was lost. Over time, it had replaced bloody animal sacrifices. Although the ritual is performed in different ways in different places, farm animals, but also birds, fish, crabs, and turtles, are everywhere released into the wild or saved from slaughter. The followers of Tibetan Buddhism believe that, in contrast to the worst vice, killing, nothing can boost the balance of karma for a person more than saving lives. Thus, they are eager to liberate animals. “The practice of releasing animals, which otherwise would be killed, is appreciated and cultivated, but we perform no ritual”, says Max, a Buddhist monk who lives at Rabten Choeling, a Tibetan monastery on Mount Pélérin near Geneva, Switzerland. Western Buddhist Monasteries in the USA and Europe offer several options for animal release. In Tibet, yak and sheep, and in India fish and birds are bought from funds obtained from the West. Also, in the Czech Republic, Christmas carps are annually liberated by local monks into rivers. Even stray animals living in the streets throughout the world are being saved as many Buddhist organizations have assimilated modern animal welfare programs into their practice. The reasons that one may wish to purchase and release animals in ceremony are several. Disease, cases of death, hunger and bad harvests are just a few examples. As the German Tibetologist, David Holler, explains in one of the few studies about the topic, by releasing animals, one can prevent rebirth under unfavorable conditions, prolong life, increase wealth, prevent unfavorable astrological conditions or protect a revered lama. Animals can also be set free out of gratitude for their services. 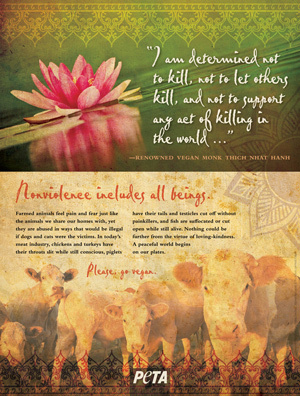 The daily religious conflict between eating meat and the ideal of non-violence is solved for Buddhists living in Tibet by leaving the slaughtering to Muslim butchers. Reciprocally, these same butchers sell animals for the purpose of saving. Marked by special ornaments, like a red ribbon tied around the ear, a short ceremony is preformed where butter is spread on the heads of these animals and prayers whispered into their ears. Owners of such a tse thar animal are considered pious people and enjoy a high reputation. Tse thar is possible at any time, but some days in the Buddhist calendar increase the karmic effect. In Tibet, animals are chosen for their physical attributes according to precise lists. Robust health or striking beauty increases the chance for an animal to be saved. Should the “wrong” animal be chosen, in the worst case scenario an angry god may withdraw his favor from the benefactor. According to Holler, tse thar is a thorn in the side of modern planners of Tibetan nomad economy. About 8 – 10 percent of the herds actually consist of ritually freed animals that grace on the sparse pastures and have no economic value. However, in case of conflict between spirituality and rationality, the religious system itself provides a solution. The tse thar status of an old animal may be transferred to a young one. In this case, there are no more obstacles for the slaughtering of the “deconsecrated” animal. In a village on the outskirts of Bern, Switzerland, there is a small fishing supply shop. There are not many customers that day. Between an impressive choice of fishing rods and extra high, olive colored fishing waders stands a huge refrigerator packed with live bait. Worms and larvae, stacked on many layers and crammed together in small boxes, wait for their final destiny as bait for fishes. But today, some of them are sold over the counter for another, more unusual purpose. A small group of Swiss Buddhists will set the insects free upon the advice of their Tibetan lama. “We bought so much bait from the shopkeeper, that he started to become curious. ‘You do a lot of fishing’, he said, and wanted to know exactly where,” Corina, a disciple of the lama, said with a laugh. The world of animals in Tibetan Buddhism is one of the six realms of rebirth. A human being can be reborn as an animal, but only a human birth can bring release from the endless circle of rebirth. Although there is a gradual difference in the significance, both humans and animals are equally capable of salvation over many lifetimes. According to Buddhist doctrine, animals are sentient beings, capable of suffering and the association with them leaves karmic traces. Therefore, many Buddhist text sources demand practitioners to not eat meat. Yet many Buddhists are still not vegetarians. That is a tricky thing and a controversial topic among Buddhists. “My lama once told me that an animal whose flesh was consumed and at the same time blessed by a highly spiritual lama might immediately be freed”, Corina recalls. An hour later, a small group of Swiss Buddhists watch as the worms seek their way into the soil of the forest. “It is a bit cold on that day and I did not know whether these tiny animals were made for outdoor life at all,” Corina says later. “I scraped some leaves together and covered the worms to offer them some kind of protection from the elements.” The action is accompanied by a short Tibetan prayer. It remains unclear how many of the released worms already found their way into the stomachs of hungry birds while the students were on their way home. Are the rituals of tse thar a substitute for a Buddhism lived only halfheartedly in everyday life? The comparison with Catholic confession comes to mind. The Tibetologist Jens-Uwe Hartmann from Munich, Germany, considers tse thar to be a rite of expiation. To what extent is the Buddhist responsible for the well-being of the animals he or she frees? “I think the main object of the ceremony of releasing animals is about liberating an animal from captivity. Death awaits us all, but dying is not that important for Tibetans. The main objective is not to torture an animal deliberately. An animal held in captivity is tortured; it suffers. Buddhism is primarily about minimizing suffering. If an animal that is released dies in the wild, it is another kind of suffering. That is not deliberate distress caused by humans. In addition, purchasing an animal for release influences the karma of the butcher, too, because he, thus, kills fewer animals,” Corina explains. How many animals survive release has never been investigated. Scientists Shiu and Stokes speak of high loss rates. The increasing commercialization of the custom increases the number of bred or wild caught animals. Many of them have to endure the trauma of air and land transportation. “Buddhist practitioners create an order to their actions. Hunters go hunting after the desired animals then middlemen sell these animals to Buddhists who release them in a ceremony, while the hunters wait to catch these animals again,” write Shui and Stokes. Most of the birds die on their way to release. The Tibetologist Hartmann calls it an exploitation of animals in order to achieve spiritual merits and the economization of religious customs. “When our monks set Christmas carps free, we make sure that the animals are released in an appropriate ecosystem. In India, however, it already happens that the fish are caught in order to sell to Buddhists for release. In Benares there are people who actually live off of the trade,” Max, the monk from Mount Pélérin tells. It is not infrequent that animals liberated in a strange environment pose a threat to the local ecosystem and suppress native species. “Scientists who critically deal with the subject meet with substantial opposition from religious groups”, say Shiu and Stokes. Releases of wild animals that have been planned with care are the exception. The education of the people involved about possible negative ethical and environmental results is urgently needed. Some nations have already started passing laws to curb the practice. A lonesome vulture circles in the cloudless sky. Below him, there is Gangtok, the capital of the ancient Himalayan kingdom of Sikkim. He flies over the 115 foot tall statue of Padmasambhavas, the patron saint of Sikkim who brought Buddhism to Tibetans. In sitting meditation posture and with a piecing gaze the statue watches the cremation that takes place in the nearby monastery. Tibetan monks are preparing the incineration of a lama who has recently died. Deceased at the age of 58 from liver cancer, Lama Chodak Gyasto Nubpa, from Los Angeles, leaves mourners from throughout the world behind. His corpse in a sitting position is carried into the stupa which has been decorated for such a purpose with white and colorful flower ornaments. Praying monks light the fire. At first the head of the lama, covered with a black and gold fabric, protrudes from the opening of the stupa. Soon the body will collapse. Grey smoke rises. There is busy activity everywhere. Some of the many participants have come specifically from the USA and from Switzerland. Among them are the disciples of the lama who looked after him and accompanied him until his death. Prior to their journey home, they now pay their last respects to him. According to Tibetan custom, for weeks in various locations around the world tse thar ceremonies have been taking place. They are meant to guarantee a favorable rebirth for the Lama and for a long and happy future life. Nadine, a disciple of the Lama, has grown very fond of the three rabbits that she rescued from slaughter upon the request of the Lama’s family while he was still living. They had hoped the deed would result in a long life for the sick man. On a meadow in Eastern Switzerland, a Jersey cow grazes. Zandora owes her life to the happy coincidence that a Himalayan Lama died. The date of her slaughter was already determined, but a member of the farmer’s family, who owned Zandora, had a special relationship with the wet-nurse cow. The woman had asked the Zurich animal welfare organization, “Tierschutzbund”, for a place in one of the few Swiss animal sanctuaries. Luckily, at the same time disciples of the Lama who had died, contacted the same animal welfare organization in search of an animal that could be saved according to the custom. “It was immediately clear to me that I would join the project”, Corina says, who had retired from work a few years ago. “On the one hand, to commemorate the Lama, who would certainly have approved our action, but also because, for me, animals are beings that have a soul and animal welfare has always been important to me. I very much liked the thought of bestowing the right to exist to a cow, without forcing her to perform because, farm animals especially, are often regarded as inanimate objects.” The release binds the benefactors for a long period of time as cows can live for up to twenty years. In fact, the survival of ritually freed animals seems to be of great importance in Tibetan Buddhism. According to the Tibetologist Holler, the inhabitants of Tibet, the Roof of the World, believes that the death of a single tse thar animal caused by man corresponds to the murder of a hundred human beings. In reality, provided the ceremony was performed, the subsequent death of the released animal in the wild is accepted as justifiably unavoidable. “It is the desired good intention and not the act that is of primary importance,” said a Tibetan Buddhist practitioner about this grey area of lived faith. According to Buddhist creed, the moment of death for a living being –human or animal – is decisive for the next life. Chatral Rinpoche, who is known in Calcutta, India for his tse thar ceremonies explains, “To a large extent the state of mind during the dying process determines the kind of rebirth. When a being is killed, then his or her spirit at that moment is in a state of fear and confusion. That is not a good pre-condition for a favorable rebirth.” However, according to Tibetan belief, tse thar animals will be Buddhists in their next life. So do the chances for spiritual development and salvation of animals lie in the hands of humans? • Chatral Rinpoche: Compassionate Action, Snow Lion Publications, 2007. • Shabkhar: Food of Bodhisattvas: Buddhist Teachings on Abstaining from Meat, Shambhala, 2004. • David Holler: The ritual of freeing lives, in: “Tibet, past and present: Religion and the secular culture of Tibet”, 1999. • Henry Shiu and Leah Stokes: Buddhist animal release practices: Historic, environmental, public health and economic concerns, 2008. • Prof. Dr. Jens-Uwe Hartmann: Aktive Gewaltlosigkeit: Die rituelle Befreiung von Tieren, 2006. Very thought-provoking article. I have read other articles on animal release recently. It seems sad that Buddhists who are not vegan, get involved in this practice when their first priority should be to go vegan.